On a recent night this winter, I found myself considering two new additions to my kitchen that promised to help me cook a proper Sunday night meal with little effort or opportunity to mess things up. On one end of the counter was the Instant Pot my mother got me for Christmas; on the other was another multi-tasking cooking device called the Vermicular Musui-Kamado, a Japanese gadget that just launched in the U.S. Both claim more or less the same thing, which is to make cooking more foolproof and food more delicious. But on every other count, they couldn’t be more different. Vermicular’s Musui is a round cast iron Dutch oven enameled in tasteful non-toxic colors. It comes with an airtight lid machined to sit flush with the rim of the pot, which enables waterless cooking. Customers have the option to add the Kamado, a custom-fit induction heating base that envelopes the pot in heat that can be adjusted in increments of one degree. When used together, the Musui-Kamado can steam, sous vide, sear, roast, and bake. The rice it makes is a dream. It’s also $670—or $300 if you only want the pot. By comparison, the Canadian-designed Instant Pot is a $100 set it-and-forget-it countertop pressure cooker that features a grid of pre-set buttons and a very questionable logo. It looks cheap—or at least cheaper than the Musui-Kamado—but it makes up for its looks with a seemingly endless list of features that let you do things like make homemade bone broth in an hour and cook dried beans in 10 minutes. Though the Instant Pot does have a slow cooker mode, that’s not the device’s forte. It’s all about speed, where the Musui-Kamado is about taking it slow. For their differences, the massive success of the Instant Pot (the company is estimated to have sold more than 5 million units in three years) bodes well for Vermicular. People love a multi-cooker right now, and in some ways, the Musui-Kamado is just the world’s fanciest version of it. 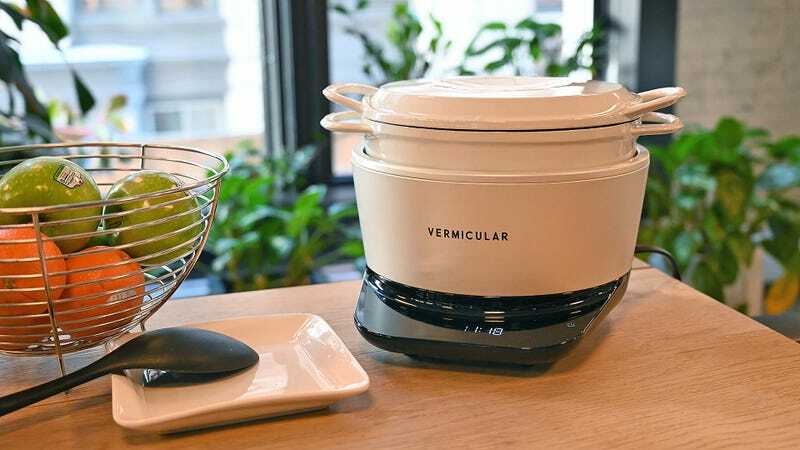 In a world of “thirty-minute chili” recipes and slow cooker cassoulet, Vermicular’s take on the all-in-one precision cooking gadget that’s so popular today is more refined than anything else you can buy right now. The question is, is it worth the exorbitant price? We’ll get to that, but first a little history. Vermicular is just now launching products in the U.S., but the company itself isn’t new. Vermicular first started making its cast iron pots in 2008, as an attempt by its founders, Tomo and Kuni Hijikata, to turn around their family’s dying manufacturing business. Growing up in central Japan, the founders spent their free time wandering around the foundry their grandfather built in 1936. The Aichi Dobby foundry specialized in precision machining iron; more specifically, it produced industrial dobby looms and sewing machines. During a downturn in the economy, the Hijikata brothers began brainstorming how they could use the factory’s primary manufacturing material—a lighter, stronger version of cast iron called vermicular graphite iron—for other products. At the time, French companies like Le Creuset and Staub owned Dutch ovens. Others like Lodge were popular in the U.S., but didn’t have the aesthetic quality Vermicular’s founders were looking for. All this to say, the Hijikata brothers saw an opportunity to bring the foundry’s technically meticulous craftsmanship to a perennially popular cooking item. And in the years since launching, Vermicular has become one of the go-to pots for the well-heeled in Japan. Used on its own, the cast iron Musui is pretty much like any other high-end enameled cast iron vessel. You can use it on a stove top or stick in your oven. It’s going to make a great stew and will roast a perfectly browned chicken—but then again, you can do that in a $60 pot, too. The founders claim the difference is in the details. The pot takes a “triple thermo” approach to heating, which is supposed to cook food more evenly. They point out the pot’s bottom, which is marked by raised concentric rings that are designed to separate food from the heat source and prevent burning. The pot’s three layers of enamel supposedly create a diffuse heat that cooks ingredients more gently. Lastly, the lid is precision machined to .01 mm of accuracy to sit flush against the pot, which allows for “waterless” cooking by locking in the steam produced from the ingredients inside the pot. The intended outcome of all this hyper-designed temperature control is that your food will retain more nutrients, and thus, taste better. The truth is, most home cooks will never notice the quiet design choices that prevent them from messing up their food, and that’s generally a good thing. Cooking is more fun when you’re not staring at a list of dos and don’ts and technical specs. Still, Vermicular does come with a learning curve if you want to maximize its features (it also comes with a sizeable instruction manual). For starters, waterless cooking is not intuitive. Neither is induction heat. Induction stovetops and hobs function like magnets. They have an electric coil that sits under a ceramic plate, and when turned on, they generate a magnetic field. The plate only generates heat when an iron or stainless steel object sits on top of it and creates a magnetic current. You can think of waterless cooking, on the other hand, like self-induced steaming. In the case of the Musui, its airtight lid pulls out the moisture from the ingredients inside the pot but avoids drying them out because the steam can’t escape. “You’re essentially steaming vegetables or meat in their own juices,” explained Bruce Mattel, a chef and associate dean at the Culinary Institute of America. With the Musui, you can cook vegetables with no added water, but it also lets you cook other foods with way less water than you’d typically use. Vermicular’s base is compact and less powerful than a full-on induction range, which can boil water in double the speed of most gas ranges. Its virtue isn’t speed; rather, it’s good for slow cooking on steady, precise heat and making things like rice that like lower temperatures. The base has a small touch screen that displays different settings. You can toggle between medium, low, and extra low heat (the range goes from 90 to 445 degrees Fahrenheit) and rice mode, which allows you choose between white, brown, and mixed rice and how you want to cook it—normal, scorched, or porridge. Cooking rice in the Musui-Kamado takes an hour compared to the Instant Pot’s 10 minutes or a gas stove’s 40 minutes, but Vermicular slow, low heat setting made every grain of rice feel like it was evenly cooked. Still, as it sat on my kitchen counter, I kept asking myself: Do I use this? Or do I just use my oven and stove top? The answer, of course, is wholly dependent on what you want to make. I would almost certainly screw up a salmon mi-cuit (half-cooked salmon), without the guidance of the “warm” heat button that will give me a perfect 113 degrees Fahrenheit. For some people, a Dutch oven is a Dutch oven, and an induction heating base is an induction heating base. For them, the Musui-Kamado isn’t worth dropping nearly $700. But the gadget is a grown-up alternative to the bunches of other multi-cookers, most of which play up their “ten things to make in 20 minutes” functionality. The cast iron Musui feels like it could be a family heirloom, in the way Dutch ovens often are. But together, it makes for an elegant cooking tool that brings together the timelessness of Dutch ovens and the very 2019-ness of precision cooking. Correction: This post originally misnamed the “porridge” and “warm” settings. We regret the error.